Preference to One Another In Honor | "Northern Crossings"
I went to bed early last night and woke to a wonderful set of pictures on my phone from the LCEF Conference. These images made my day, and no matter what happens for the rest of this day I can go on my way rejoicing. I received pictures of the presentation of the Art Haake Leadership Awards for Lutheran Church Extension Fund. 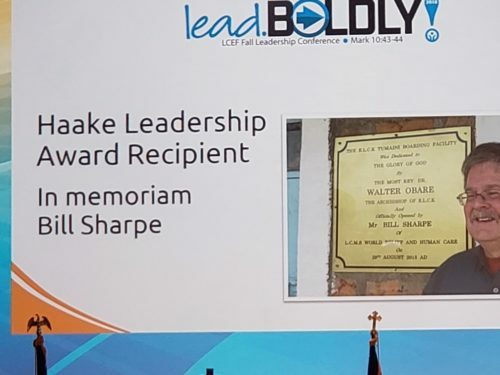 Bill Sharpe who used to write on this blog and who passed a while back was a recipient. Bill and I have been many places and done a lot of stuff and to see this award given to him posthumously is a wonderful thing. Bill’s entire life while I knew him, was an explication of Romans 12;10. “Be devoted to one another in brotherly love; give preference to one another in honor”. That Bible passage is the picture of Bill’s life. He could devote himself to others and give preference to others because he knew that Christ had given him all things by His suffering and death and resurrection and that if he had been given all things he could also give all things away. Bill was a constant watchman on the ramparts trying to find ways to make things better and to help others. He was a spokesmen for the “orphan and the widow” and a voice for the voiceless. He was unfailingly instant in care and concern and looking for ways to be the hands and feet of Christ. He was a strong advocate for the churches’ “life of mercy”. He was fine lay theologian and loved to discuss the theological treasure house that our churches emphasis on “witness, mercy, and life together” can be if we study it together. His work on behalf of Project 24 was tireless and his righteous indignation when things were going badly because of the frailty of our human nature was as fierce as an Old Testament prophet. His understanding of that frailty and the motivation of the love of Christ caused him to search for solutions and not just complain about problems. Project 24 and Christ’s Care for Children, Kenya, are successful and doing well because of Bill’s strong leadership. He was a true leader in every respect and he did it by example, face to face reconciliation, humor, and a strong reliance on the Gospel and it’s exuberance in forgiveness, mercy and grace. I miss him a lot and there are many days when I go to call and remember that he is not here any longer. He is present however in the institutions he helped to fund and establish; the projects he helped to organize and caretake and make better; and the attitude that we exist not for ourselves but for our neighbor. The Gospel for Bill was peace in the blood bought redemption bought by Jesus. It was also a fire in his bones that gave him his marching orders everyday. An honor well deserved and I am so happy for Gale and Bill’s daughters and son. They have great memories of their Bill and so do the rest of us who worked with him. This is another.